Closing accounting books is an important and the final step to the accounting cycle. At the end of the accounting period the books are closed to begin a new period with a fresh start. The four steps of closing the accounting books are closing the revenue accounts, closing the expense account, closing the income summary account, and closing the dividends account. An Accounting Book Closing Checklist allows a bookkeeper to track the individual steps that the financial book closing procedure is comprised of. A bookkeeper should use an Accounting Book Closing Checklist because it organizes the account closing procedure and helps to ensure timely, accurate and transparent financial reporting. The customizable nature of the checklist allows the bookkeeper to fill in the company name, all relevant contact information and the date. Company logos may be added to provide a professional touch. The easy-to-use template ensures all aspects of accounting book closing are considered. Checks written, accounts payable, journal entries, run reports and payroll entries should all be accounted for. 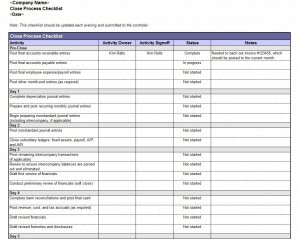 Ensure that each step of the accounting book closing process is checked by using this free to download Accounting Book Closing Checklist. A column for a second reviewer of the checklist is provided to certify the previous bookkeeper’s work. Prepare the accounting book closing process beforehand by having all the necessary paperwork ready and within easy reach. This will allow for a faster and more accurate closing process. Always remember to carry over Asset, Liability, and Equity account balances from cycle to cycle while resetting the Revenue and Expense accounts back to a zero balance. Summaries of each account are also necessary to the closing process. Make sure to back up data regularly and save all work before closing. Accounting records are vital to a successful business so it is essential to have both paper and electronic records. Every business must complete all steps to the accounting process. Use the Accounting Book Closing Checklist to assure quick, accurate and easy accounting processes.